NIFS state-of-the-art, 65,000-square-foot fitness center and degreed staff make us stand out from all the rest! Is your employer part of the NIFS Corporate Wellness Program? If they are, you are eligible for a reduced membership rate! There are no hidden fees and no contracts. Everyday you'll get NIFS best membership deal — guaranteed! This 14-week membership is designed to motivate you to make lifestyle changes that will help create a healthier you! Assessments include BOD POD®, Functional Movement Screening (FMS), Heart Rate and Blood Pressure measurements. Includes goal-setting, with past and current exercise experience for developing your workout plan. Your trainer will create a personally designed workout program along with an equipment orientation. NIFS is excited to announce that access to the IU Natatorium pool is now part of your NIFS membership! Eligible members have free and unlimited access to the lap swim pool*. Stop by the service desk or get your Nat pass. Click here for lap pool schedule. Members receive a free personal fitness assessment with NIFS degreed staff. Your personal workout programs can he updated monthly with a trainer at no additional fee to you! Be sure to schedule this fitness assessment at sign up. No one makes a better workout buddy than a friend! 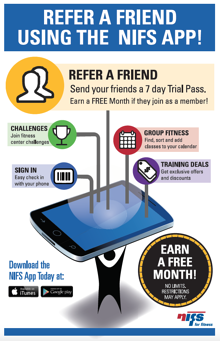 Through NIFS referral program, earn a free month when you refer a friend that joins NIFS! No limit to referrals. Now refer a friend easily from our mobile app! Want the most up-to-date group fitness schedule, fitness challenges, or a way to track your workouts? Download the NIFS mobile today!